In a medium dish add the flour and a sprinkle of kosher salt and mix together. Dredge each soft shell crab in the flour on both sides. Heat coconut oil in a large skillet over medium high heat. Add crabs to the skillet and sauté until they have started to brown. Flip and repeat on other side. Add the chopped chives and butter. Sauté for a few minutes, until the butter is melted and bubbling and the blossoms or garlic have become fragrant. Plate and eat the whole crab even the legs – they are simply delicious! Try Solaire Chardonnay by Robert Mondavi (Santa Lucia Highlands), Hahn Estates Chardonnay (California), Rodney Strong Chardonnay (California), Skinny Dip New Belgium Brewing (Ft. Collins, CO), Saint Arnold Texas Wheat with a lemon wedge (Houston, TX) or Paulaner Hefe-Weizen (Germany) with lemon wedges. To get you started purchase them the day you are going to make them. When buying the soft shell crab, have your fish department do the initial cleaning, which will take the soft shell crab from alive to cleaned and ready for cooking. Many people cook them at that point, but I recommend cleaning them one more time. This requires just a few minutes of running them under water and removing a few things that may not be appetizing. 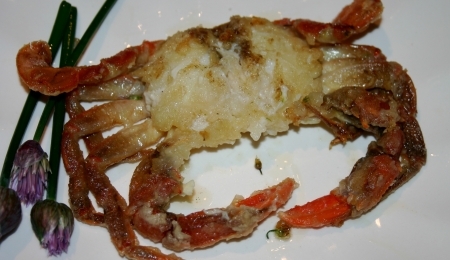 Remove the top soft shell from the crab body. It is like a flap that would be the top cover of the crab when hard. Then remove all of the yellow pouches inside the crab and rinse under cold water until all cleaned. At this point you are left with all of the crab body and legs. After rinsing let them drain and move onto cooking them.